My oldest comic book is also my oldest Amazing Spider-Man issue. When I was about 11 or 12 my local comic shop, Fantasy Books & Games in Livermore, was selling a copy of the oldest Spider-Man issue I had ever seen in person. The shop had it up on the wall with a $90 tag on it. It was tattered and definitely worn, but I assumed that is how all books looked from the early 1960's. I asked my father to buy it for me, and he did. Granted I had to work for him doing yard work for the next year, but it was well worth it to own a piece of history of my favorite comic book character. The Amazing Spider-Man #6 was created by Stan Lee and Steve Ditko in 1963. It tells the story of the cover villian The Lizard who is the transformation of Dr. Curt Conners. Dr. Conners had lost his arm in a war and attempted to create a serum which would help him regrow his limb. Using lizard DNA (because lizards have the ability to grow back lost parts such as tails) Dr. Conners experiment was a failure. Sure it grew his arm back, but it also turned him in to a vicouse lizard-like monster. Conners would revert back to his human form after some time and be unaware of the violence he had commited towards others. Plus, while in human form, his arm is still missing. Bummer. 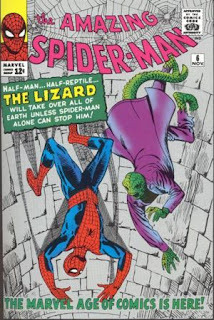 "Half-Man...Half-Reptile...The Lizard will take over all of earth unless Spider-Man alone can stop him!" Really? One Lizard guy is going to take over "all of earth" (odd phrase - not just part..."all")? In the most current issue of Wizard magazine (Wizard #222) there is a countdown of the worst girlfriends in comics. As the title of this post suggests, Rogue is Wizard's choice for the worst girlfriend in comic books. The idea of a beautiful and lovable woman that you could never touch is too painful for any man to bare. In honor of Wizard's number one tease, Rogue #1 is the comic of the day. 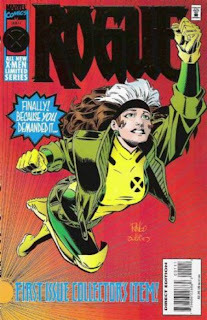 Rogue #1 was the first Rogue solo story. It captures the story of Rogue's past and current relationship with men. To love a boy/man and not being able to express that love physically brings Rogue great inner pain. The issue tells of her first and last romantic interaction with a boy, when she kissed a boy named Cody and put him in a life-long coma. The issue also introduces her newest admirer, Gambit. Their relationship is one where he chases her and she keeps pushing him away, at one point literally. The issue is basically a reintroduction to the character and her problems. By the way, apparently this pretty lame Rogue story was in demand. After all, the cover even foil-stamp-outlines, "Finally because you demanded it.." First of all, did we demand a Rogue solo comic? And second, what is with the dot, dot, dot? It is as if even Marvel is saying, "Really? This is the book you demanded? Fine. You demanded it..."I can read the tone Marvel. I have to admit though, the best part about Rogue #1 is the cliche book design. It has the classic foil-stamped title which so many books started doing around it's time in the mid 90's. It also has the "First Issue Collector's Item!" label on the cover. This was common for first issues around this era because of the earlier comic pricing boom. First appearances of characters and first issues were shooting up in value. Marvel tried jumping on the train of "act fast to get a future gold mine" comics. Marvel marketing was at full steam during this era. The Rogue #1 interior is also littered with ads for video games and for Marvel subscriptions. Remember those? Marvel subscription ads. They had the boxes with check marks and the cut-out markings around the page so you could send in your request, with a check or money order of course. Basically, they market the book as being a "collector's item", but then encourage you to rip it up and buy more comics. Marvel Marketing! Can you imagine someone cutting a comic up today? Blasphemy! In a time when dead meant dead (or so we thought until about a year later) DC dared to kill the most well known comic book hero ever. Based on a joke during a planning session, the Superman team decided that the world had taken the untouchable guardian for granted, and so...they killed him. In 1992 Superman would meet, put down, and die at the hands of the strongest character he had ever faced in Doomsday. The Death of Superman tpb collected the breakout of Doomsday (from the earth) and the eventual battle between the monster and the man of steel. As the issues, starting at the Adventures of Superman #497, moved forward both the battle intensified and the panels per page reduced from 4, to 3, to 2, and final to one panel per page in the 22 page climax, Superman #75. 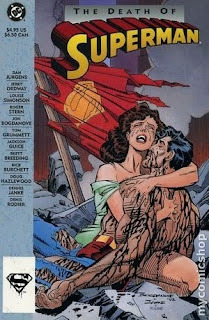 Superman gave his life to end Doomsday's destruction and died in the arms of his fiance, Lois Lane. Following Superman's death was the arch "Funeral for a Friend", which explored a world without Superman, and next by "Reign of the Superman". The latter introduced 4 pretender Supermen whom were all eventually replaced when the real Superman returned from death. My father gave me this book as a gift for my birthday in 1992. It was the first tpb, or any type of collection, I had ever read. Though I was a Marvel fan I was still human and understood the importance of Superman. I saw the movies and understood that he was the most famous Superhero in comics. The death of this icon really felt powerful to me as a young child. No one could kill Superman! Yet the symbol was down and the impact on comics and me had been made. Many readers of about my age can recall this event very well. It was in the news and one of the first comic books to cross the publishing gap with fan interest. I myself will occasionally purchase a DC superhero title based on this strong showing by Roger Stern and the Superman trust. Looking back it is actually quite funny that Superman died at the hands of what he was most known for brute strength and power. I guess I always thought it would involve kryptonite or Mister Mxyzptlk. Crazy imp. 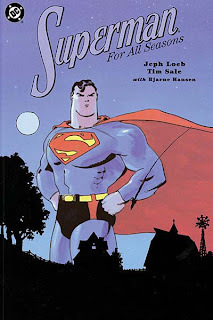 The classic comic collection and bold iconic story telling of The Death of Superman makes it the comic of the day. During Marvel's "Secret Invasion" event they threw a ton of mini-series and stand-alones at comic book collectors. Some comic books added to the overall story and other were just casual side stories designed to capitalize on an event's sales or highlight an up and coming artist or writer. The Captain Marvel mini was a mix of the latter and also a way to explain Marvel bringing back a classic character into normal continuity. Captain Mar-Vell was a Marvel character who died many years ago. He was a Kree (alien race) soldier who possessed great powers and protected the Earth and the Marvel universe. He eventually developed a terminal cancer and died in the first Marvel large-format graphic novel, The Death of Captain Marvel. He was a very popular character in the early 70's for Marvel comics. 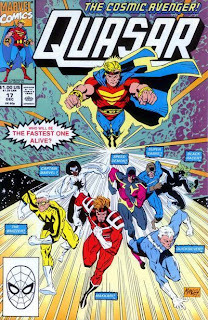 Marvel created several different Captain Marvels after Mar-Vell's death, but none had the same star power (so to speak). In Captain Marvel #5 (of 5), the return of this classic character is explained in a way only comics can. In a nutshell...The Captain Marvel that actually returned was a shape shifted Skrull (arch enemy of the Kree) that was created as a sleeper cell to gain earth's trust and then strike when the Skulls intended. The Skrull's, Khn'nr, memory was stored away only to be triggered when he saw a certain image. But in the final stages of Khn'nr's creation he became conscious and broke out of his restraints before his memory trigger had been set in place. Thus, the new Captain Marvel thought he was the original Captain Marvel and would never revert back to his real Skrull memories. Got it? Feel free to re-read that. Brian Reed writes a fun journey through the mind of a lost legend. Discovering Captain Marvel's true self takes us through a faith filled adventure. His God like presence and resurrection sparks a group of followers wanting to believe in something eternal. The historic imagery (which triggers some sort of memory reaction...which the Skrulls implimented) used throughout this book and series includes: "Alexander Entering Babylon", Garden Path at Giverny", The Mona Lisa", The Potato Eaters", and "A Sunday On La Grande Jatte." Any book that can fit these clasical works into a comic book with little green men (the Skrulls) is always deserving to be the comic of the day. I've decided to go ahead and dedicate every Sunday to my favorite comic book character, Spider-Man. It only makes spider sense: The Amazing Spider-Man comes out thrice a week and my back bins are packed with many different Spidey titles. So without further adieu (besides this sentence furthering the...adieu?) let's get into our first Spider-Man Sunday! Where do these endless mobsters come from? With times being tough, I guess it is easy to recruit uneducated, out of work, men in New York. Good thing too, since they are killed in almost every frame in the first half of this issue. In The Amazing Spider-Man #618 a new mini story arch begins involving the crime the Maggia crime family. The tale begins with a montage depiction of powerful members, with in the Maggia family, being killed by bullet, by explosion and by worse. Sensing the growing weakness of the Maggia family, Mr. Negative and his newly established crime organization attack the Maggia's and kill kill kill until the friendly neighborhood Spider-Man shows up to break up the shiney sword skirmish. As the story unfolds we discover that the Maggia killings may not be killings at all. 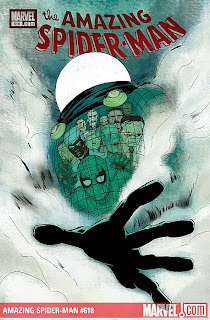 Diseption is a foot as it always is when Mysterio is on the cover of The Amazing Spider-Man #618. Ol' bubble-head makes his appearance as the issue begins to wrap up. Mysterio is drawn just as goofy as ever by the excellent change of pace artist Marcos Martin. Martin's style of simplistic 50's artistry works well with the issue because it has a "creature features" feel to it. The old hokey 50's monster films ("The Creature From the Black Lagoon", "Godzilla", etc.) had a awkwardly fake and cheesy feel to it, much like the weird Mysterio character created by Stan Lee and artist Steve Ditko. Martin's style reminds me of that ear of Ditko art a lot. Marcos Martin is also aided by the wonderfully off beat and muted tones of colorist Javier Rodriguez. His shades of reds are especially beautiful and fitting for Martin's style. The Amazing Spider-Man #618 is the comic of the day because it is Sunday, and it is the most current web-head book on the market. I also thoroughly enjoyed the horrible pun (Dan Slott writes) by Mysterio when he is first revealed to the reader. His real name is Quentin Beck. This is helpful information when understanding why Mysterio corrects a mobster who introduces him as "Mysterio" with the line, "...call me Mr. Beck. As in 'Beck' from the grave." The hardcover addition of this Marvel cosmic-spanning mini series is not even out, yet it is still the comic of the day because on this day I found out it will be shipped in a few months. We are currently in a comic book era in which almost every story arch is collected in a trade paper back addition and the a hardcover addition. Like regular books that release a hardcover and then a paper back version some time later to generate more sales, the comic book publishers (especially Marvel) have been doing the same. 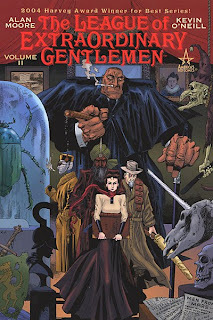 Some critics of the massive amount of collections (tpb and hc) claim that the comic book industry is suffering due to the fact that many casual comic readers will wait until the whole story is collected in a single book. The story reads straight through, and one doesn't have to wait a month for the next issue (at times just 22 pages of a 75 page plus story) to be released. Others have said that collectors will buy both the individual issues and the collection, but I think that case is rare. 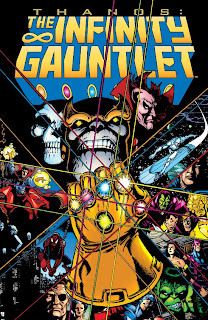 Back to the mini series, The Infinity Gauntlet...it was good and it was cool. 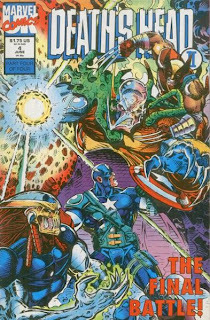 It was the first major crossover of every popular Marvel character that I took notice to as a young comic book reader. It actually helped explain the importance of each character in the Marvel universe by showing the order of power in their universe. The evil titan Thanos, like all evil powerful beings, lusted for more in The Infinity Gauntlet. Thanos gets his hands on the power of the Infinity Gauntlet and becomes the most powerful thing there is in Marvel. Characters such as the Silver Surfer and Adam Warlock attempt to thwart Thanos and eventually do. The fall of Thanos can also be chalked up to love: his love for Death, the female incarnation. The story includes famous characters like the Hulk and Spider-man being helpless against true God-like power. The Infinity Gauntlet puts characters into perspective, and when your young those lessons are key to understanding future stories. A perfect example is when the Silver Surfer, who was thought to be the fastest thing in the universe, tries to sneak up and steal the gauntlet from Thanos. At the last instant Thanos moves and avoids the Surfer. The moment gives an awesome sense of speed and makes for a "wha wha" moment. As I mentioned before, I think it is rare for a comic book buyer to get the individual issues and then the collected addition; but this, is one of those rare cases. Joe the Barbarian #1 was going to be the comic of the day no matter what because of it's $1 price tag (no actual tag was on the book...that would be odd). I came across this issue when a random kid in the comic shop asked Mike, the owner, if the book had come in. Receiving his confirmation, the kid walked briskly to the book and grabbed it right away. He seemed so determined and excited for the book I figured...what the hell. I picked it up, noticed it was only a dollar, and kept it in my pile. 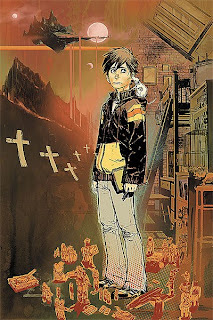 A Grant Morrison and Sean Murphy creation, Joe the Barbarian is published through DC's Vertigo line and can therefor use DC characters in the book. This is important to the book (so far...it's only the first issue after all) because the main character has a bunch of toys which include DC action figures. The book follows Joe, a young boy who father has passed. He is a loner who keeps to himself and comes home to a mouse (or rat maybe) and his action figure toys. What happens next I am not to sure of. I believe Joe falls asleep and wakes up in between dream/fantasy world and real life. In the fantasy world he is confronted by his action figures who are real, including a mock Optimus Prime who is named Ultimus Alpha (since the Transformers are under Marvel trademark). How the story is constructed at the end leaves me wondering if Joe is having a dream or...well, I don't even know what else. I guess I will see what issue 2 has in store. Sean Murphy's art looks good. It has a very Vertigo feel to it. Not quite polished, but appropriately so. Also, colorist Dave Stewart does a great job of mixing up the tones of colors between the moods of the book. His (possible) dream world, when he is not with the action figures in his sleepwalking-like moment, has a bright fade to the colors making the reader understand that something is off about Joe's experience in that moment of time and location. Besides a bad typo on page 3 ("It it" should be "If it") the book is off to a great start. I'm looking forward to issue #2. When its late on a Wednesday, and I have yet to nail down an issue to talk about, I fall back on Wolverine. Wolverine Wednesdays may appear from time to time. When a Wolverine titled book captures the attention of a post, it will most likely be a Wednesday. This Wednesday I pulled the classic Wolverine #79 (vol. 2) from the box of "W's". The issue is memorable for the single page (and I guess cover for that matter) where Cyber snaps a set of Wolverine's claws off. At the time, Wolverine was recently without an adamantium skeleton because Magneto had ripped it out of him. Tough as Wolverine was, he still fought with his claws popped. When Cyber, an adamantium-skin baddie, notices Wolverine's lack of metal he stomps off a set of his claws with his foot. In an odd turn of events, the metal that had protected Wolverine's bones and body for so many years was fiercely used to break that which they covered. The cover for this comic book says it all. Wolverine's broken claws on the ground in front of him laid in a pool of blood while wolverine could only snarl in agony and rage. While the particular story in Wolverine #79 is not memorable, they stories as a whole surrounding Wolverine's adamantium loss had their layers of intrigue. I like the idea of, "what does a feral beast do when that which has been his great source of power and weaponry has been taken from him?" I liked the thought that Wolverine would not lose his intensity along with his metal. Who he is is deeper than bone. Looking back at Wolverine #79, I remember feeling like this was a "death of" issue. The adamantium and Logan's claws were so much a part of who Wolverine was that when the metal left and his claws broke it was as if Wolverine himself was gone. 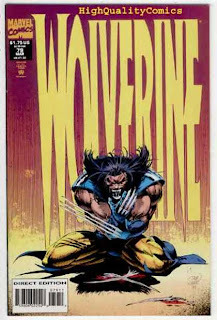 Wolverine #79 is the comic of the day because it provided a very defining moment in my Wolverine history which I still think about today. This book is a classic example of Marvel pushing out a book just so fan-boys with dreams of owning classic old comic books will purchase. Just another way for Marvel to make money. The content has already been created. Marvel simply copy-pastes everything together and ships it out. The profit margin on this book has to be high. This makes it worth Marvel's time. Some nostalgic comic nerd will pick this issue up...I did. I actually like owning this book because it lays out the key beginnings to classic Marvel characters: Spider-man, the X-Men, and Iron Man. I think the old covers are especially interesting because so many artists create works based on these early iconic images. When characters on another modern book use the poses or style it brings the reader back to a time of simple, straight forward, story-telling times. This particular issue, Official Index to the Marvel Universe #1, is also quite relevant to the times because these characters make up Marvel's most popular movie lines right now. These characters are possibly at their peak of pop-culture popularity through television, comics, and movies. Giving this issue to a non comic fan, who enjoys the movies, may give them a sense of the characters meager beginnings. I use the sister test on it. Would my sister like it? My sister would like it. Bingo! 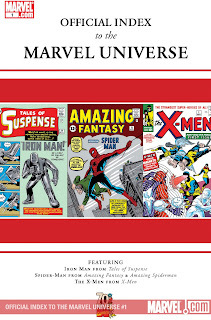 Official Index to the Marvel Universe #1 is the comic of the day because it collects the comics of back in the day. Where as yesterday's comic of the day was in honor of my new HDTV, today's comic of the day is in honor of my new HDTV which came broken (it had a faint black bar across the screen). 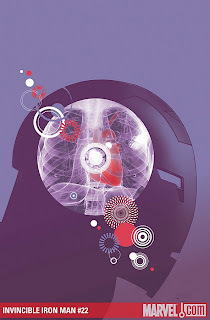 The Invincible Iron Man #22 seems to fit my situation because the current story is titled "Start: Disassembled." After setting my HDTV up I had to disassemble it, jigsaw it back into the box and get it replaced. Unlike the comic; however, it was not a pleasant experience. The Invincible Iron Man has been a good comic book from issue one to the current issue #22. It reads well and includes characters that are both important to the main Marvel continuity and have a lot of history with readers. Unfortunately, issue #22 is the "Two Towers" of the current arch. Not much happens, but it is still entertaining. Tony is still unconscious and a threat to him, while Tony is out of commission, is becoming for evident. This story line feels like an excuse to bring in the classic Marvel players as guests to boost sales. First they brought Thor by, then Captain America, and now Doctor Strange. They are all trying to bring Tony back from a life stuck in his own head and memories. I think if anything significant happens to Tony Stark, like him waking up, it will happen in the Siege mini series. The variant covers Marvel is releasing are nice. You can pick the style of cover you care for most. Some readers may want to grab both, but for others you have an option between styles. Art deco (Salvador Larroca) or straight forward (Rian Hughes). Matt Fraction has put together a book that is very strong in dialog and story, but untill Siege and this storyline is over he may not have a ton of freedom to write a story he has complete control over. This is a title I will continue to pick-up but I have a feeling I may like it more come issue #25. In honor of me getting my first ever HDTV, I have chosen Hawk & Dove #9 as my comic of the day. This particular issue is one of those issues comic collectors have because it came in a bin or box they bough, not knowing what exactly came in it. 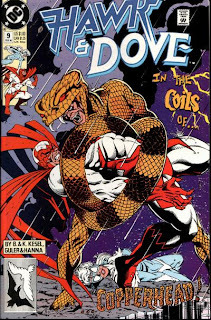 To be honest, I do not have many DC (non-Vertigo) titles and Hawk & Dove is a great example of why. Hawk and Dove are characters that combine together, as a team/duo, to make one well rounded force. Hawk, like the bird, is strong, fast, and aggressive. Hank Hall, a.k.a. Hawk, is a bit egocentric. At one point in issue #9 Hawk and Dove are watching for the Flash/Superman race which is supposed to pass by them. Hank wants Superman to win because "at least he's American". The line gives you a sense of where Hawk's mindset is at. Dove is the opposite of everything Hawk represents. She is thoughtful, intelligent, and very fluid in battle. She is the yin to Hawk's yang. Dawn (Dove) is reserved and practical. Often times when in battles the reason the duo wins is because Dove figures out a way to stop the villain. Its like figuring out the pattern of attacking the stage boss in a video game: you can try to just use brute force, but there is usually a trick to defeating the enemy. Dove beats games. Hawk breaks the buttons on your remote. Smallville used to be good. Don't get me wrong. When all of the seasons went on sale for $10 each at Best Buy, on Black Friday, I still bought all of them. But the quality of the show has declined in recent years. As the seasons changed, so did the show. The original premise and appearance of the show was very appealing. The show started with Clark Kent living with his parents on the Kent farm. The show at it's core was not about the story of Clark's life with powers, but rather the relationships he shares with close friends, family, and community. The story in which the show draws from is most obviously Jeph Loeb and Time Sale's, Superman For All Seasons. Jeph Loeb splits Superman For All Seasons into seasons (surprise, surprise) narrated by the thoughts of important people in Clark's life. Starting in the Spring, we follow the narration of Jonathan Kent, Clark's father. This season represents the changes in Clark's life. He is discovering his powers, graduating from high-school, and moving away from the Kent farm. Through Jonathan's narration we understand both how a father feels when their young one grows up and doesn't need them anymore, and how Jonathan's worry for his son's future is natural and out of love. The bonds between a father and his son have always been a theme in Superman comic books, but Loeb captures the moments when fear is based on love and the changing of the times or status quo. The Summer season is the transition of Clark and his Smallville life into Superman and his Metropolis life. Small town to the big city. Narrated by Lois Lane, a new type of woman to Clark, we learn how Clark feels lonely and out of place. Yet at the same time, when he returns home for a visit, he feels out of place there as well. The winter is narrated by Lex Luther, Superman's arch enemy, and we are given an understanding to the "why" involved with Lex. Lex loves Metropolis in a twisted way. His jealousy of Superman roots from the fact that the city loves Superman back and only acknowledges Lex. Lex hates Superman because the city loves Superman. Ending in Fall, Loeb has Lana Lang, Clark's first love, close out the narration. Lana loved Clark before he was Superman and acts as an anchor for Clark when he feels he has let down Metropolis. Lana wanted a life with Clark but let's him go because she knows he is meant for much more and it would be selfish for her to keep him. The story closes out by Clark understanding that life changes like the seasons, but his morality and character which has been shaped by many people (including the four narrators) will remain the same. Tim Sale's art in the book is in the classic Tim Sale form, yet he fuses many Norman Rockwell like imagery with his depiction of Smallville. The panels give the reader an understanding of the simple life outside the city. This adaptation of Sale's art to the Rockwellian style maybe Sale's best work. Though the writing is timeless, the imagery alone could tell theis story. Superman For All Seasons is the comic of the day, but could be the comic of any day because it is truly a masterpiece. This is the definitive story of Superman. Joe Kelly does it like no one else in the Spider-man universe. 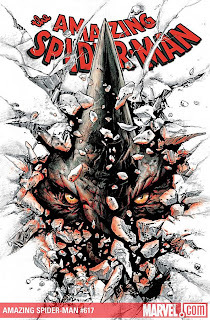 He joined forces with Chris Bachalo to bring back a classic Hammerhead character not too long ago and he has now been given the Rhino reigns with Max Fiumara to bring back the brute of a beast. The issue let's us in on what the Rhino, Aleksei Sytsevich, has been up to since his last stint in jail. Apparently he met the woman of his dreams and uses her love, and their marriage, to control his urges to revert back to a life of crime. The issue introduces an unknown new Rhino like villain who calls Sytsevich out to fight. In what turns out to be an interesting exchange, Spider-man convinces Sytsevich to hold on to his love and let go of his pride. Kelly brings out emotion in an otherwise emotionless character. Rhino had always been written as a standard big dumb bad guy, but now we see that maybe he just needed something he hadn't yet found (his wife) to find his true depth as a character. Kelly also balances Peter Parker's personal life and the plot of the issue with great command. He moves the overall story along while still addressing this single issue's topic: the Rhino. And the dialog...spot on. When I here Spider-man in my head (and I do) he always uses Joe Kelly's words. Funny, realistic, and true to the character established long ago. Max Fiumara also pencils another issue the way only he can. He gives a nice rough (without looking sketchy) feeling to the Rhino characters, which is perfect when dealing with a character like Rhino who, like the skin of the animal, feels rough. His Spider-man design is also very unique. Like Chris Bachalo, Fiumara establishes a version of Spider-man that is his own. He draws him slender, yet muscular. Plus, his mask design gives Spider-man's eyes a sleek ninja-like look. Almost like his eyes are reading a person or his thinking is being performed by his eyes. Lastly, the coloring of Fabio D'Auria works perfectly with the dark tones that loom around an ex-super con. In the scene at night when Spider-man and the Rhino (not in costume) talk, the color of Spider'man's costume has a dark bold red that accents Fiumara's costume design perfectly. A simple image of Spider-man gesturing to himself, while giving advice to an ex-arch-enemy in the dark, makes a reader feel like they are there in that moment. Its quite a powerful frame. And that frame seals why The Amazing Spider-Man #617 is the comic of the day. For all of the Teenage Mutant Ninja Turtle toys I owned (including the best toy in the history of toys: the electric Turtle Pizza thrower) and all of the TMNT episodes and movies I watched over and over, I only own one turtle comic book. Unless I end up buying another turtle related book, this will be the only Teenage Mutant Ninja Turtle post on 365 Days of Comics. 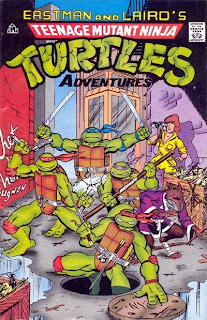 Teenage Mutant Ninja Turtle Adventures #1 (distributed by Random House in 1989) is my comic of the day because it covers classic turtle characters and story lines. The book must be about 75 pages long and includes a maze and word search, which I filled out since I was about 6 or 7. I've also ripped off part of the last couple of pages in the book. Looking back I laugh at the fact I used to be so care-free with my books and how now I am like a crime scene investigator. David Caruso walks up. "Another major comic stolen. The store owner was tricked out of possession of the comic book. Well, it looks like we're going to San Diego boys, because we're looking for a major...comic-con." Whhhhaaaaaaaa! Anyway...Ninja Turtle book includes classic villains such as the Shredder, Bebob and Rocksteady, Krang, Baxter Stockman, the mousers, and of course plenty of foot soldiers. 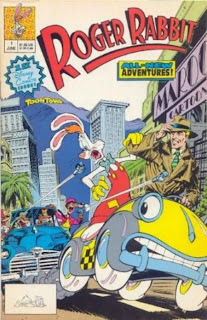 The turtles meet the April O'Neil and the Greaser kids from Dimension X who fly hover cars. The book has a lot of cool fighting and includes scenes in the sewers, streets of New York, and the Technodrome. I must have re-read this book a thousand times. Plus, I still have drawings of the Ninja Turtles I made by copying the way they looked in this book. It is so torn up now (from old age), but I love this rag of a comic. Teenage Mutant Ninja Turtles Adventures #1 is totally radical! In this first full appearance of Carnage in Amazing Spider-man #361, Mark Bagley cements himself a position in my heart. His art version of Spider-man in the mid 90's (which is different than his current version as in Ultimate Spider-man) is so clean and crisp. Bagley creates muscular characters to give the art a comic feel, but not over the top and cartoony. His Carnage is not over the top when it comes to the amount of symbiot that comes off of his body. 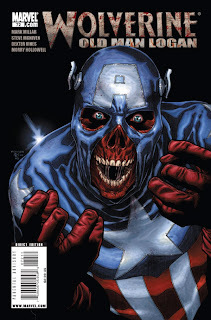 In the cover, Carnage secures Spider-man and visually expresses pleasure and a sense of evil. 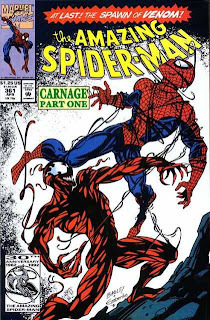 The similar appearance between Carnage and Spider-man lets the reader know that when all things are equal, Carnage can handle Spider-man easily...and that is terrifying for Spider-man. This is my favorite cover of all time, not only because of the art, but also for the feeling of love it invokes. When I first bought this issue i was a kid and enjoyed comics for the simple amazing super-hero stories they are. This is the era of comic books that hooked me (early to mid 90's). 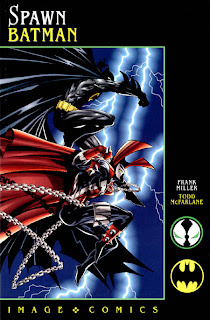 In 1994, comic book elites Frank Miller and Todd McFarlane combined talents and companies to create a memorable one shot titled: Spawn/Batman. The comic book was released through Image Comics but it included DC's Batman. The story itself is not important. The Frank Miller name alone is what drives this title's words, not an ingenious short story. Miller had already written classics such as: The Knight Returns, Batman: Year One, Electra Lives Again, and Sin City. This issue wasn't meant to push Miller's status; but rather, it was used to increase sales. Though, I do enjoy the dialog between Spawn and Batman during their battle. Handling the illustrations on Spawn/Batman is the most popular artist of the late 80's and early 90's: Todd McFarlane. McFarlane had made his name over at Marvel with runs on The Amazing Spider-man, Spider-man, and the Incredible Hulk. In 1994 he was the main name at Image Comics carrying the Image name on the back of his creator-owned ongoing series Spawn. On Spawn/Batman his art is as always: filled with a great sense of movement and capetastic characters. Let's face it...when it comes to drawing Spawn and Batman, you better be pumped for plenty of cape. It does seem more important for an artist to always be on his or her game as opposed to a writer. If a browser is unsure if they should get an issue and just flip through a book, the art is going to be the selling point. While McFarlan shines in this one-shot, Miller doesn't necessarily hurt his status. Miller is put into a situation where there isn't much room for a story. The book is a cross-publisher single issue designed for promotional purposes (increase sales). There is only so much Miller could have done. Overall the book is a nice issue to own and even go back and enjoy from time to time, but it is the comic of the day because of the that last frame in the story: a batarang thrown in between the eyes of a smiling Spawn. I typed and retyped the opening sentence to this post about 12 times. Exceedingly extraordinary, mesmerizingly memorable, flat-out knock-down amazing: those were a few of the phrases I tried working into the attention grabbing opener to the post, but only "wow" seemed to work. Very few artist are in his class when it comes to current comic book covers. James Jean and Alex Ross may be the only artists able to outshine Marko's string of instant classic covers. 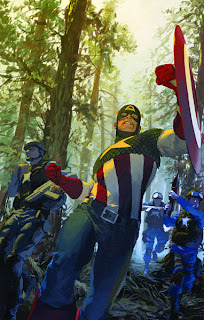 "The Marvel Art of Marko Djurdjevic" displays Djurdjevic covers in almost chronological order. Spanning his opening series of X-Men: First Class through his Thunderbolts, Ghost Rider, Daredevil and The Mighty Avenger days, the book includes (on top of the visually stunning covers) Marko's comments on his art and accomplishments. Plus, there are thoughts and words from various industry creative heads. The book also includes sketches, previously unreleased art (as of July 8th, 2009) and multiple cover redesigns. There is even a section where we see Marko's Secret Invasion covers and the various classic covers they emulate. Plus, and most importantly, the hardcover includes my favorite Marko Djurdjevic comic cover: Thunderbolts #111. Transcendent. The comic of the day is definitely "The Marvel Art of Marko Djurdjevic." It has insight into the artist's mind; it has over 200 pages of some of the finest comic book covers ever, and it has a new very proud owner...me! 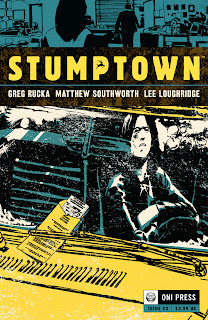 Two months and two days later the follow up issue to Greg Rucka's new series Stumptown finally hit comic shops. The comic of the day Stumptown #2, is Rucka's Oni Press book which follows the strong woman presence of Dex, a private investigator, on her continued search for a missing person. Rucka's P.I. story isn't necessarily a new story, but it reads with a certain tempo that makes the reader anticipate every next scene and page. In Stumptown #2, Dex is still trying to figure out the who, why, and where, but we learn a little bit more about her personal life, as well. New characters are introduced. We meet friends. We meet enemies. Stumptown #2 progresses the story and the interesting world of Stumptown. Rucka's artistic partner, Matthew Southworth, does an excellent jump of harnessing the feel of a P.I. book with a believable and gritty lead character. She is drawn attractively, but not over the top. She has a modest shape, disheveled hair, and, in this issue, she walks around with a shiner which makes her face appear a little messed up. She feels tough enough to be a private investigator, and still retains her feminine appeal. To not touch on Lee Loughridge's coloring would be a crime. Loughridge uses a very limited color pallet which include dulled tones. The lack of bursting color keeps the city feeling mysteriouse yet familour: like an old town you've driven through many times, but never actualy got out of the car. The art for this book only adds to Rucka's superior writing. Rucka's team puts out an excellent book...now if I can only get the next one quicker. 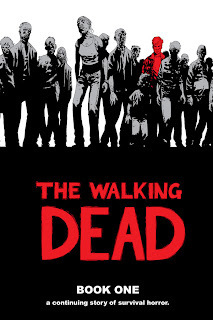 Becoming our first collection, today's comic of the day is The Walking Dead: Book 1. 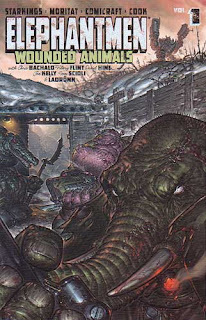 Robert Kirkman and Tony Moore began their run on this post apocalyptic zombie survivors tale (that ol' chestnut) back in 2003. Published through Image Comics, the story of a group of people trying to get by in a zombie infested world is brilliantly told and appropriately colored...in black and white. The lack of color brings a feel of nothingness, or lack of hope, to the book that only ads to it's horror. The Walking Dead: Book 1 collects the first two story arcs and comes in a large scale hardcover. The HC includes the first 12 issues, which if purchased individually are quite expensive (especially the first issue). The hardcover collections make for suspenseful reading in big zombie biting baby chunks. The Walking Dead: Book 1 is the perfect gift sure to spark anyone to fill out their book-shelves with Kirkman's continuing stories of survival horror. "Reed Gunther is a goofy and exciting, all ages comic book, independently created and produced by brothers Shane and Chris Houghton." The best thing about indie books is that there are usually no ads and you often get more pages for your money. Reed Gunther reads very quick. Not for lack of words, but rather the pace of the book is kept lively due to the movement of story and whimsical artwork. Shane Houghton's character's expressions such as "Biscuits and Gravy! ", "Curdled Milk! ", and "Talluca Lake!" add to the fun western atmosphere created by the brothers. Plus, Chris Houghton's characters and settings match the story tone perfectly. The old prospector like character with a horn to his ear is a great example of the caricatures Chris designs to convey a playful wild west. If you are looking for a nice change of pace book that has a wholesome child-like feel to it...this may be your book. 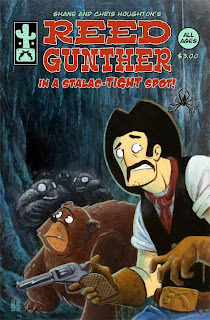 Plus, Reed Gunther, the cowboy, has a bear sidekick. Did I mention that? This first Dark Avengers Annual installment has Brian Bendis bringing a powerful character back into the Marvel main stream...again. Marvel Boy, a.k.a. Captain Marvel, is written back into the ongoing Dark Avengers series after running off early on in the Dark Avengers run. The issue explores Marvel Boy's path and what his personal mission on earth is. Mixed in is a mini battle with The Sentry which gives readers a glimpse into what Marvel Boy is capable of. In the end, we see a transition from a lost alien Marvel Boy into a guided Marvel Man...we'll just stick with the title Captain Marvel since the name Marvel Man is already taken. 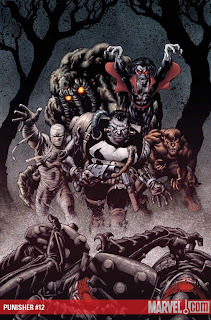 Dark Avengers Annual #1 is brought to life by superstar artist Chris Bachalo. 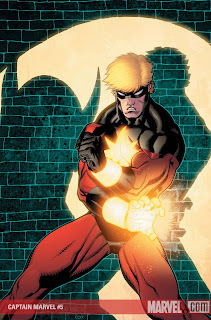 The movement and power can be felt in his action sequences and panels. Plus Bachalo, not being the main artist for Dark Avengers, brings an alien style to the book which fits perfectly with the alien outsider Captain Marvel. Not to mention Captain Marvel's slick costume redesign is displayed perfectly by Bachalo near the closing page. 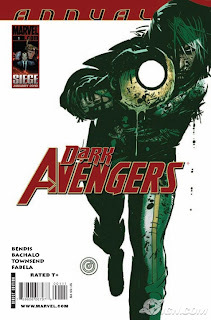 Released in December of 2009, Dark Avengers Annual #1 is the comic of the day because Bendis and Bachalo created a comic book that reads with energy and has the imagery to match. Coincidentally, the first comic of the day isn't even a comic book: it's a Calender. On Wednesdays comic book publishers release their new comic books of the week; however, last Wednesday (Dec. 30th...2009) the major publishers did not release a full array of books. 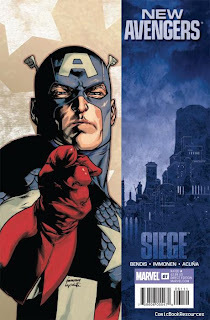 DC released one issue (Blackest Night #6) and Marvel released a free Siege preview issue and a free Marvel 2010 calendar with art by Marko Djurdjevic. 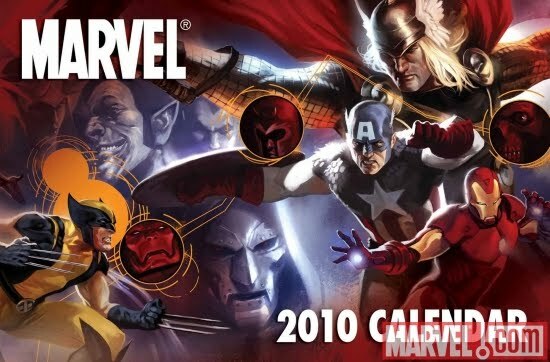 The Marvel 2010 calander has the demensions of a normal size comic book, and thus, can be stored in a bag'n board for collecting. Personally, I grabbed several to collect, use, and hand out to friends. The appeal of the calender is not that it is free, but rather the art the calendar contains. Djurdjevic is Marvel's James Jean. He is their go to guy for standout exclusive covers. His work can be summed up in his covers for Ghost Rider. 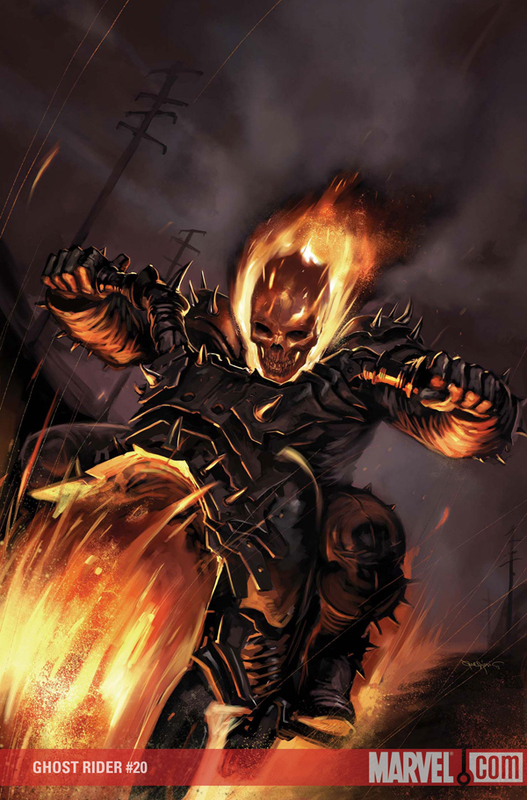 Ghost rider is a tough character to draw realistically because, well...he's a head-on-fire skeleton riding a motorcycle (which is also on fire). The way Djurdjevic wields the flames on a ridiculous character makes one feel the warmth of his art. Though ol' flame head isn't in the calender, the collection of characters is still stunning. My favorite months are April, featuring The Thing, and May's Iron Man.